WPW’s Cactus League tour continues, this time with the Oakland Athletics. 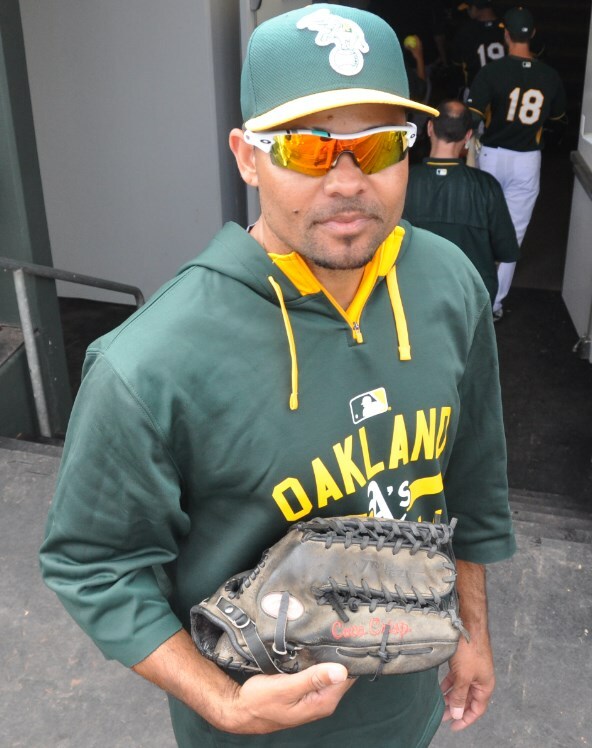 Coco Crisp told us his Rawlings Heart of the Hide PRO-TB is headed into its 9th season. I posed this question on Instagram: considering the amount of ridiculous diving, crashing, leaping catches Crisp has made in the last 8 seasons, can you think of a more distinguished piece of leather in the game? A few consummate Oakland Grinders in this gallery. Eric Sogard told us he mixes a few companies in, but in the two games we watched, he only swung the Phoenix ES10A model bat pictured. 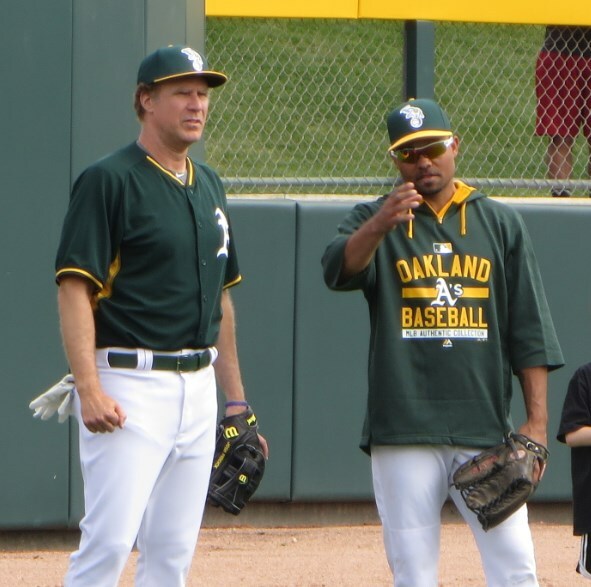 Sogard also wore the Cutters Power Control batting gloves, jackin’ Will Ferrell‘s style. We also saw him in the 4040v2 turfs along with too many other A’s to count. Sam Fuld wears a Rawlings PRO303-6JB with green script, and took his BP cuts with a Marucci custom cut. Swiss Army Knife Ben Zobrist’s told us that the glove he was wearing, a Rawlings Pro Preferred PRO200-2KBR, will be his gamer this year. He was wearing the New Balance 2000s, a plastic version of the 3000. Sean Doolittle’s Rawlings Two Piece came out of the box looking dirty with dark brown leather, but it looked purdy in the sun. 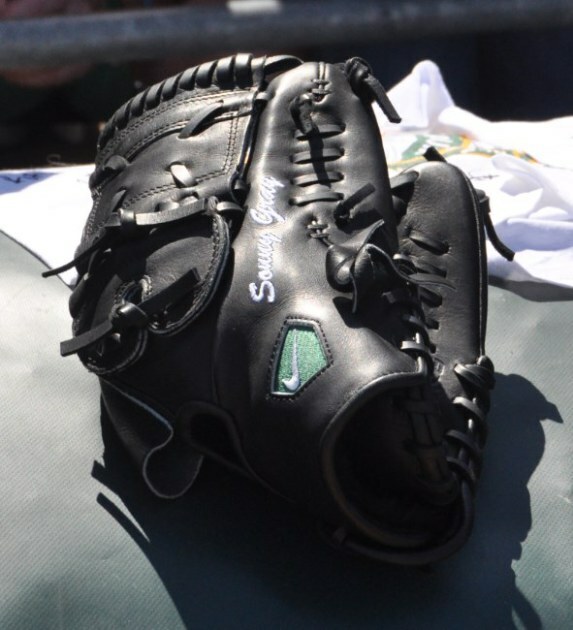 Sonny Gray looks like he’ll stick with the Nike Two Piece we’ve seen him wear in season past, while Spring Training hopeful Brock Huntzinger had my favorite glove for the A’s, a light tan Rawlings Pro Preferred Modified Trap with green in all the right places. Billy Butler has been getting plenty of work in at first base, and we noticed his gamer was a black Mizuno, but he is breaking in the green Pro Limited GZP 32. After that is a shot of Butler’s Mizuno model bat, the AD67, which is normally not something we see—usually the closest we can get is the trademark, on which Mizuno’s never go into detail. Brett Lawrie’s Nike Vapor Pro cleats have a colorway exclusive to Lawrie. He was swinging a Tucci BL-420 bat and said he expects that to be his gamer this year. Lawrie’s Mizuno glove is barely recognizable, looking like he bathes it in baby oil each night, but it looks like he’s working in a new black one with the inscription BL13 on the ring finger. Turd Ferguson (Josh Reddick) did not dress for the game. Coco Crisp’s Slugger M301S is not a model we’re familiar with but it looks like its available at that link. Billy Burns, a burner who stole 54 bases in the minors last year, was rocking the adidas EQT batting gloves and some pretty looking Energy Boost Icon cleats. Finally, 3B coach and former infielder Mike Gallego leaning on an SSK PS-100 fungo with the Lizard Skin grip. After that, some gorgeous leather from All-Star and Rawlings for non-roster invite Bruce Maxwell, a Brett Fungo w/ an old Kurt Suzuki Wilson piece, Peter Gammons giving those NB’s a beat down, Rickey in the Nike Frees, and former A’s catcher and All Star Ray Fosse had some encouraging words for A’s new backstop Josh Phegley. Better distinguished glove i can think of, Pedroia supposedly had the same glove up until “The 3-time Gold Glover reportedly had a glove that he wore from the time he was ten years old until it broke in his first professional game, at 21 years old.” from WPW yourselves. that might be the only contender! thanks Joey! i think the one you’re talking about is a Marucci though! Keep an eye on it. Yes, It’s the Marucci one. Thanks for the help Mike. They claim that Cutch wears their guard, but I don’t think its true! Yeah, I’ll check, it seems like the Benik Jeter and Tulowitski wear except with the design of a 1999 Douglas one. I am baffled that J Don didn’t go with some red white and blue evoshield digi camo though. Who is wearing that! Why is nobody wearing the digi camo gear except Alex Gordon! Donaldson wears the Nike air lunar MVP 2 in white blue jays colors in the blue jerseys, and I’m assuming grey with the grey pants. …And now we know the undershirts 99% of pros wear. It is the hypercool on and it comes in 3/4 and short. On Eastbay they have about 5 Yankee ones that look everyone will wear on the squad.